Jobu discusses the Relegation of one of Argentina’s most prominent fútbol teams. Picture this scene: It’s late September, the Yankees are playing the Red Sox to close out the season, and both teams are tied for last place in the standings (I know, the Yankees would never be last…). Normally, only pride would be on the line in this game, but what if the stakes were a little bit higher? What if the loser had to go play in the Independent Atlantic League against the likes of the Bridgeport Bluefish? Sounds crazy right? Well, that’s what can happen in international soccer (fútbol for the sake of this post), and that’s what happened in Argentina this past weekend. River Plate, one of the most storied franchises in Argentine fútbol (get used to the term), was relegated to the Nacional B division for the first time in its 110 year history. How it basically works is this: every year teams have a chance to move from division to division depending on how they play during the regular season. If you’re terrible, you might end up dropping down to the lower division. On the other hand, if you’re in the 2nd division and you play well, there’s a chance you could move up to the first division for the following season. It is difficult for American fans to really understand the impact River Plate’s relegation is having on the team, and the rest of the country. South American fans don’t just root for their teams. Their teams are their lives. In the U.S., we have four major sports. If the Yankees don’t win this fall, the Giants might win this winter (wishful thinking, yes). If River Plate loses, that’s all fans have. After the team failed to win their game Sunday, which meant they were being relegated, fans were so overcome with despair and anger that they began rioting before the game even ended. The game was basically called with a minute to go. They couldn’t finish the game because fans were fighting, throwing debris at players and each other and even setting fire to parts of the stadium! Again, this is the first time this team has been relegated in its 110-year history. They have won the first division 33 times, which is the most of any club in the league’s history. This is literally like the Yankees being sent to the independent league for a year for finishing last (bet you Sox fans would love that). Relegation is not just about “We’ll get ’em next year.” In River Plate’s case, this could literally fold the franchise. Like most teams, they rely on endorsements and sponsorships, as well as television revenue, to field their teams and pay salaries. Without this money, will they be able to pay their players? Will they be able to afford any of their other costs? Will players leave for greener pastures? This is not a team that is used to surviving in the 2nd division. A team that is more used to being relegated from time to time is more capable of coping with a change like this. 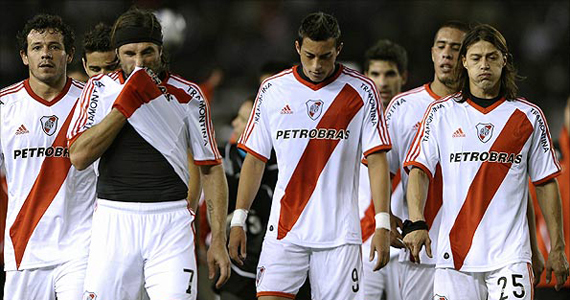 River Plate doesn’t know how to run things without all the extra endorsement and TV money. They could very well ruin the franchise as a whole. This might be an extreme way of thinking about things, but it’s not that far from reality. I mean, look at the LA Dodgers. They didn’t get their TV deal and now they’re bankrupt. Despite its possibly catastrophic consequences, how great is the relegation/promotion system? What a great way to keep leagues competitive. Would the Marlins ever have held their infamous post-World Series fire sales if finishing last the following season would have meant they were no longer in the major leagues? Would they have traded all of their big contracts if it meant they could probably have lost all of their sponsorships, endorsements and television contracts? Rawlings and Nike aren’t going to endorse a minor league team for millions of dollars, and FOX isn’t going to pay them $100 million for a television deal if they’re playing in Scranton/Wilkes Barre. I think we really need to bring this system to the States. Let’s not get crazy and do this with any of the four major sports (yes… hockey still counts), but why not try it with the MLS? After all, it works best with South American and Eruopean fútbol, so why not with the bastardized American equivalent? Anything to get people interested in the sport, right? Let’s do it! 1. Actually, relegation is the norm in soccer all over the world, and MLS had to get a special dispensation from FIFA to not have to do it. And yes, it’s great. Imagine the other side of the coin: Scranton WB plays Pawtucket in the IL finals, except the winner gets to play in the AL East next season. How great are those games? MLS should definitely do it. It means most teams have something to play for until almost the very end of the season. Also, to add color to this, it used to be that relegation in South America was determined by a team’s performance during that season, which is how it’s still done in Europe. 10-15 years ago, Argentina changed that to a points-per-game-played three season rolling average, (with newly promoted teams only counting however many games they played in first division during that time), specifically to avoid one of the bigger teams having one crappy season and being relegated. They figured those teams have more money, so if they had one bad year they would spend to bring new players in the next and improve. This spread throughout the Americas and is now the norm there. And STILL River went down, despite the shenanigans. 2. Apparently, there is security camera footage of River Plate execs leading a group of team hooligans through a security-clearance-only door into the referee dressing room at halftime, and the hooligans telling the ref either he calls a penalty for River in the second half, or they kill him. Of course, the execs did not think to have the cameras turned off, and now RP may actually start next season with as much as a 20 point penalty. So they start at -20. Have fun getting back to first division. By the way, with River up 1-0 and needing to win by two goals to offset the result of the first leg, the ref did call the penalty, and River’s striker missed it. Only in Argentina. And perhaps Russia. Great job by you River. 3. Also, the team’s president, who won a ton of stuff with River and at least one World Cup for Argentina as a player in the 80’s, openly demanded that the head of the Argentine Federation (who has been in power pretty much forever) resign because of corruption a few months ago. And now River has been relegated. There are Central American dictators who think Argentine futbol is embarrasingly corrupt. 4. Finally, Maradona is suing River Plate AND Grondona (the head of the federation) for negligence and mismanagement due to RP being relegated. Is Maradona a fan of River? No, he played and roots for archenemy Boca Juniors. Is he involved with River in any way? No. Does he even have a soccer-related job right now? No. But he’s suing, because hey, whatever keeps his name in the papers and distracts people from his pathetic stint as national team coach at the last World Cup is good stuff. Items 2-4 I heard from dad today, so take them with a grain of salt. But they’re probably true.